Ultrasonic belt cleaners utilize ultrasound technology with transducers, which are positioned in the cleaning tank. These transducers emit sound waves in a purifying solvent, which thoroughly scours the furnace belt. Ultrasonic belt cleaners collect particles that come off of the furnace belt, so that these contaminants can be safely drained away. Preserving the cleanliness of your furnace belt is vital when it comes to prolonging the lifespan of a furnace, and ultrasonic belt cleaning is the best solution to long-term furnace belt maintenance. Ultrasonic energy infiltrates obscure regions of the belt, which means that all areas of the belt will be comprehensively cleansed. This means superior cleanliness, and will guarantee a better working environment for the furnace. 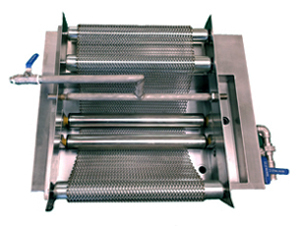 Ultrasonic technology offers incomparable cleaning consistency throughout the entire belt. Ultrasonic cleaning also works faster than any other conventional cleaning procedure in the elimination of contaminants. When ultrasonic technology is used, there is far less risk of products getting contaminated, which improves product yield. 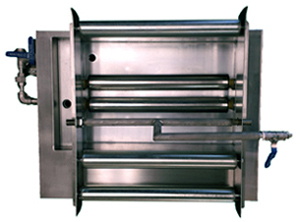 Belt Width Up to 1000mm/40"
Integrating the belt cleaner into the furnace is straight-forward. 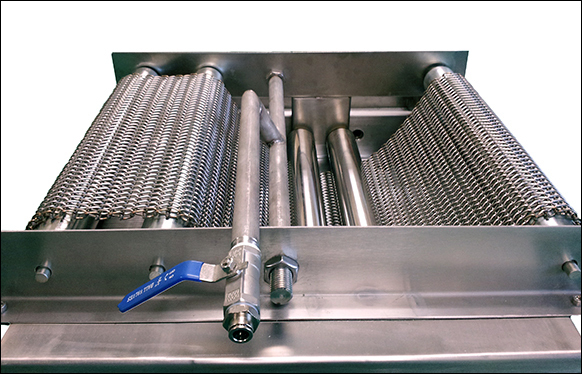 The ultrasonic cleaning is inline, so the belt travels directly through the tank and there is no need to disassemble the belt from the furnace. The belt can pass through the tank whenever necessary. We also offer an additional option, which provides a method to dry the belt when it comes out from the tank, if so desired. Please contact us to learn more about how this technology can help you!